There's an old saying that Christians sometimes use to refer to the new birth, "Born once, die twice, born twice, die once." The nonbeliever will die both spiritually and physically, but the born again believer will only die physically. Hebrews 9:27 tells us that "it is appointed unto men once to die" and that is the end of that. But wait a second, what about reincarnation? Most believers take belief about reincarnation and lump it under the heading lies-the-devil-tells-some-people, and then summarily dismiss it. I used to do it myself. It's a deception plain and simple. And yet it isn't plain and simple. At least not to me anyway. I saw a story once about a young boy who remembered growing up in a different county. He was able to direct his parents to his 'old' house; he knew things that he just shouldn't know. He could describe the inside of the house without ever having been inside it. 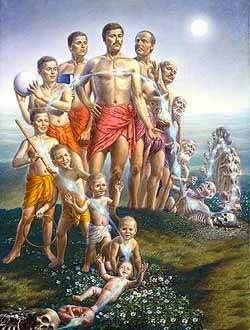 This story changed my view on reincarnation. It wasn't that I questioned the biblical idea of dying once. It just brought this topic of reincarnation out into the open where it couldn't just be dismissed with a thoughtless wave. And there are a number of similar cases of children recalling past lives -- just Google it. Now, if my memories are stored outside my brain, it is quite possible that every once in awhile somebody else might accidentally link into it and get the wrong memories. It's like two computers with the same IP address or two houses with the same mailbox number -- sometimes the mail gets sent to the wrong house! There is some evidence that yogi masters can access the ZPE field by inducing an alpha state in their brain waves. This same thing occurs when people are hypnotized. If that's so, then it also helps to explain why people who are hypnotized often come away with memories of past lives. They accidentally link up to the wrong address when they were under hypnosis. They experience genuine memories! I like this argument a lot. It allows the Bible to be true while also allowing that, at times and under certain situations, some people do have memories of past lives. It also enables a skeptic like myself to say that just because you remember living that life does not mean that you are the one who actually lived it; it just means that you remember it.